Manual Driving Lessons, Crash Course Assessor, Intensive Courses Instructor, Pass Plus Instructor. Hi, I'm Andy. 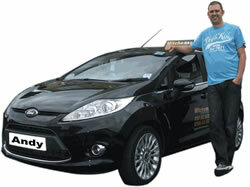 I have been a qualified driving instructor since 2005 and I have had a high pass rate in the years that have followed. I believe that this is due to my relaxed, patient, friendly and flexible approach to my teaching. I work according to your individual needs and will willingly adapt around your strengths and areas for improvement. I am a full member of The Institute of Advanced Motorists, which means that I am highly skilled in ensuring that you make rapid progress towards passing your driving test. I work between Tuesday and Saturday and offer a wide variety of lessons on weekdays, in the evenings and at the weekend. I offer lessons to people who are either just starting to learn; people with experience or are at test standard; or people who wish to re-sit a driving test. I also offer intensive courses and pass plus courses. I deliver my lessons in a Vauxhall Astra dual-controlled car, which is ideal for all learners as it a diesel engine. This means that it is an easy car to learn to drive in as it makes the basics easy to acquire, resulting in a smoother drive. Pupils consistently comment on how easy it is to drive. I use progress sheets so we can both keep an accurate record of how well you are doing and so we can track your progress towards your driving test. Also I offer in car help with theory and hazard perception tuition.